Teaching your toddler healthy hygiene habits takes time and patience, but the experts agree that the key is to start early. Here’s how to get your toddler on the highway to good hygiene. Teeth time: Parents should begin cleaning their children’s teeth as soon as the first ones emerge, says Tom Breneman, president of the Canadian Dental Association. Although at first you can just wipe your baby’s teeth with a cloth, he says using a brush is a good idea “as soon as you feel comfortable putting it in their mouths.” No toothpaste, though, at this early stage — just a wet, toddler-sized toothbrush. If they insist on toothpaste, apply a thin smear — just enough so they can taste it. Once the back molars appear (usually by age two), Breneman suggests also teaching your toddler to use dental floss. “There may be times when they will resist, but you need to be consistent and persist with it,” he says. On the nose: “Imagine when you have a cold and someone else is going to wipe your nose,” Vernon says. “Your nose is tender and sore, and you just know the other person won’t be as gentle as you would be. That’s how your toddler feels when you come up and give her nose a swipe.” One possible approach: Ask your toddler to start wiping her own nose, and you’ll finish up. Then be gentle! 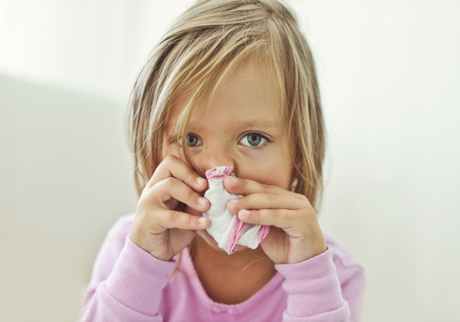 A washcloth or cloth hankie dampened with warm water may be more comfortable than a tissue on a sore nose. Brush out: Some toddlers don’t mind having their hair brushed. Others have fine hair that tangles easily, or thick hair that gets knotted or matted every time you wash it. A shorter haircut might be the solution, if brushing means a flood of tears. There are also lots of great detangling products, some to use when washing hair and some to spray on before you start brushing. “You can also offer choices around this,” says Vernon. “You can ask if your toddler would like to sit on the counter or on the bed while you brush her hair.” Or you can put on a favourite video for her to watch while you work through the tangles. Your ultimate goal is to have your toddler understand that you believe cleanliness is important, and to be able to carry out these routines independently. That’s going to take time — Breneman, for example, says parents should brush their children’s teeth until they are five or six years old — but a positive approach now starts them on the right route for the long run.